In recent years, a catastrophic global bleaching event devastated many of the world’s precious coral reefs. Working on the front lines of ruin, today’s coral scientists are struggling to save these important coral reef ecosystems from the imminent threats of rapidly warming, acidifying, and polluted oceans. Coral Whisperers captures a critical moment in the history of coral reef science. Gleaning insights from over one hundred interviews with leading scientists and conservation managers, Irus Braverman documents a community caught in an existential crisis and alternating between despair and hope. In this important new book, corals emerge not only as signs and measures of environmental catastrophe, but also as catalysts for action. Irus Braverman is Professor of Law at the University of Buffalo, the State University of New York. She is the author of Planted Flags: Trees, Land, and Law in Israel/Palestine (2009), Zooland: The Institution of Captivity (2012), and Wild Life: The Institution of Nature (2015). 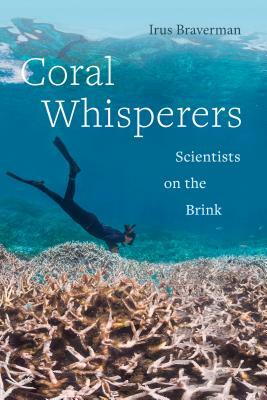 "Coral Whisperers is exceptional in its scientific detail but also in relating the personal stories of the scientists, or “whisperers,” who follow the lives of corals and invest their own lives in striving to preserve them. Just as important, the book is a stern warning that the earth’s oceans are in grave danger." "Analyzing the dual narrative of hope and despair that defines many environmental concerns and discussing the challenges of the various approaches to protecting coral reefs worldwide, Braverman, an experienced diver and an expert on land-use law, brings thoughtfulness and urgency to this well-organized work."